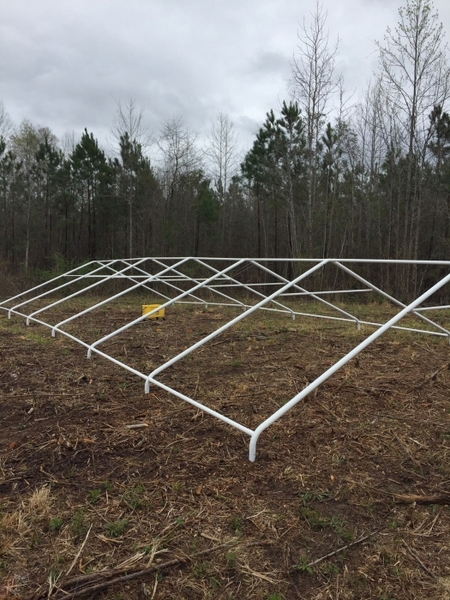 The frame of this sturdy structure is made from beam welded 2" diameter steel that has a thermoset baked on powder coating to prevent rust, weather, peeling or chipping. The wide foot pads on each leg make the base extra sturdy and provide secure anchor points. The assembled frame will handle all but the most severe weather conditions. 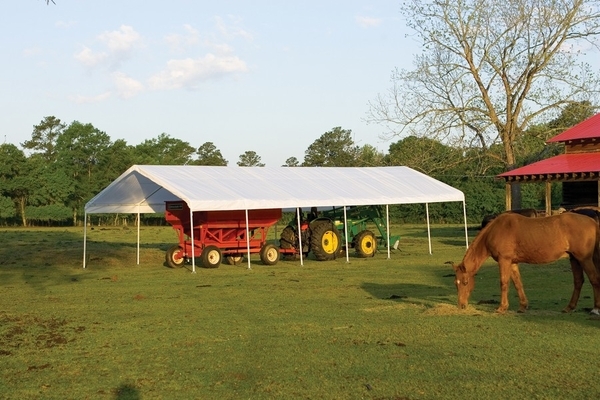 The canopy secures to the frame with the Twist-Tite technology tensioning system to make it wrinkle free. The Easy-Slide Cross Rail system clamps tight to square up and lock down the shelter. 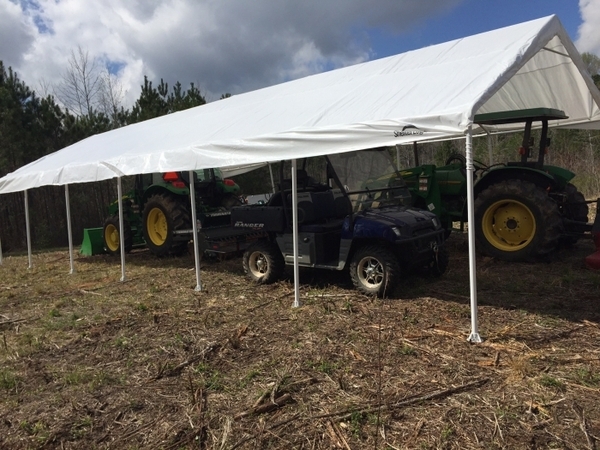 The rip-stop canopy is of triple layer heat bonded polyethylene that is 100% waterproof and is UV treated to resist fading, aging and fungus. The cover has a 10 year life expectancy. The package includes the frame, cover, 40 SL bungee cords, 14 foot plates, temporary spike anchors, and instructions. 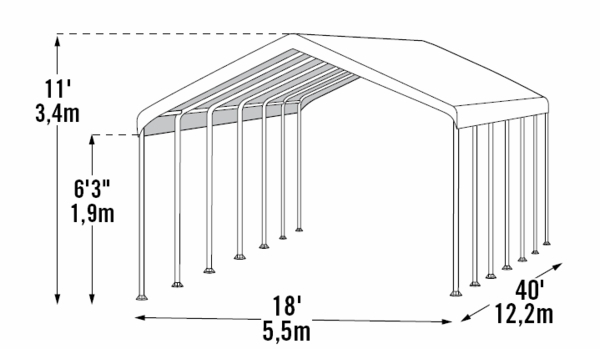 How is the height of this canopy measured? Is it from the peak or the sides? The 11' height listed on this item is the peak height. The sides measure 6'3" below the overhang of the cover. You can see the illustrated dimensions in the smaller inset picture below the main picture on this page. Simply click on it and it should become larger. What guage is the frame? The manufacturer states it has a 22 gauge frame. 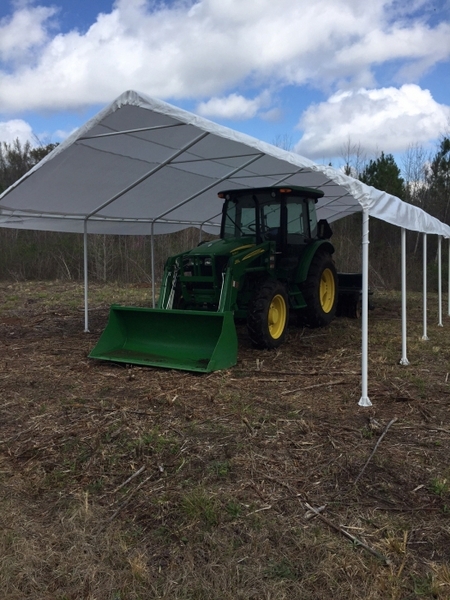 Putting farm equipment and everything in the garage under the canopy.What a relief no more working in the sun on equipment.